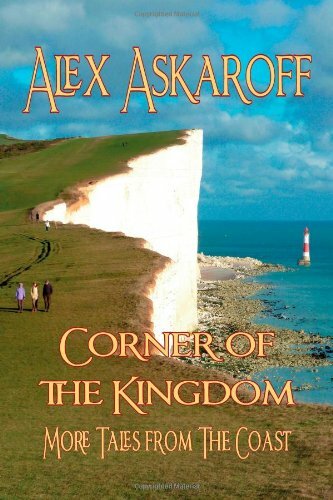 SEWALOT, GREAT BRITISH SEWING BEE, ALEX ASKAROFF. Don't you love the beauty spot. Where have they all gone? 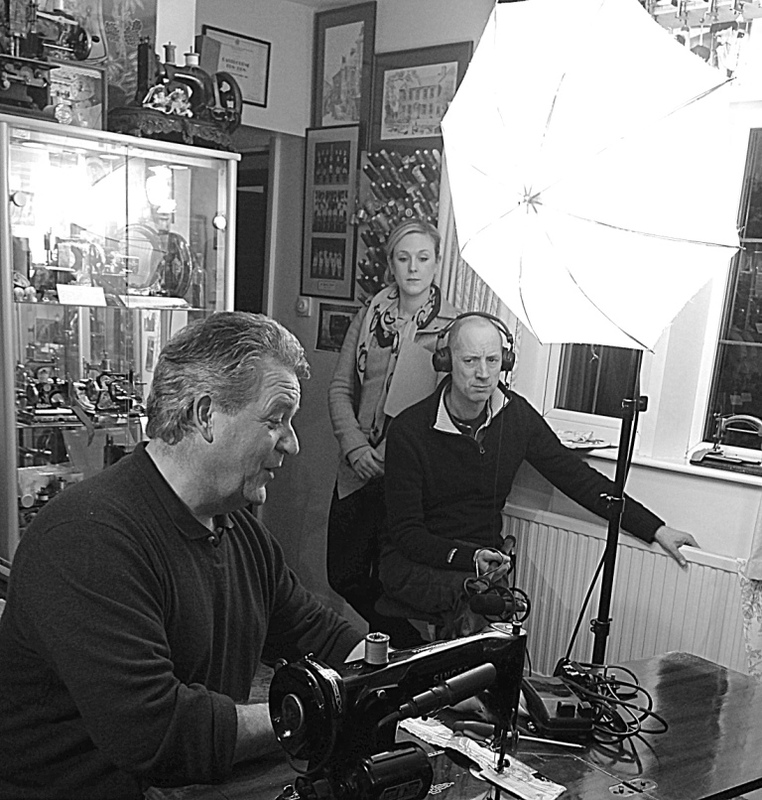 I have been working with the television production crew for the BBC series of The Great British Sewing Bee and we wanted to pick an iconic sewing machine to film. Well, in the history of sewing machines there was one model that leapt out, the Singer 201. Claudia Winkleman introduced the Singer I was talking about and I went on to explain a little about how to buy it with hire purchase. All the girls in the competition had to use the Singer 201 and several had fond memories of using them in the past. However most had forgotten what brilliant sewing machines they were and found that they produced a superb stitch on all the modern fabrics. Alex Askaroff filming of a VT clip for The Great British Sewing Bee. 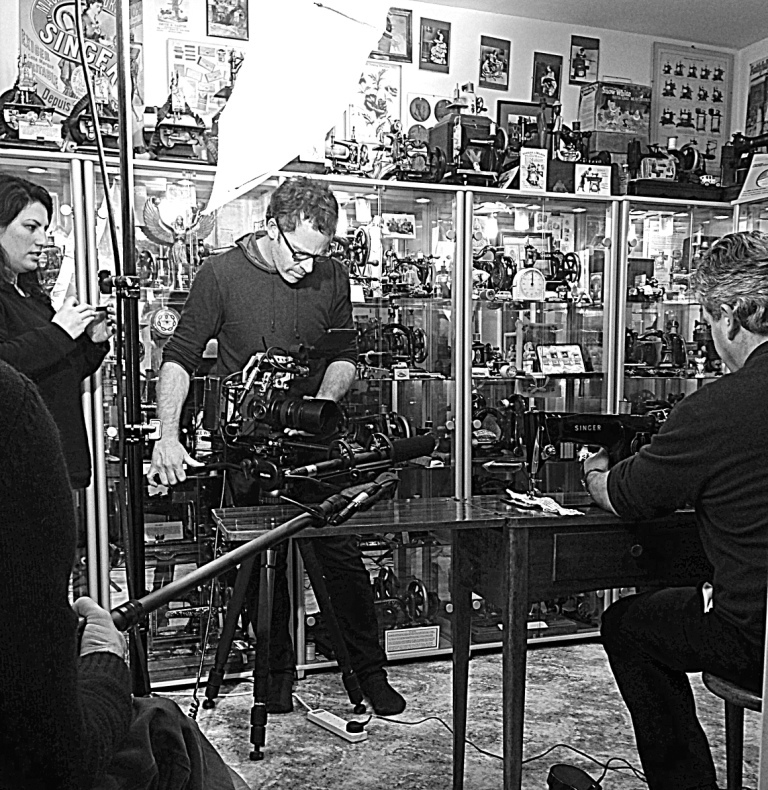 We all jammed into my little museum for filming and after five hours the lights had made the place like a sauna. Because of continuity I could not take my jumper off. People have been seeking out an alternative to the throw away plastic sewing machines of today and you have to look no further than the Singer 201 which will sew every day and last a lifetime. More than that every stitch the machine makes will blow your mind from the sheerest silk to stoutest denim. Someone once said to me that 'nothing lasts like quality' and the Singer 201, built by families that had worked for generations at the same factories, proved the case with the Singer model 201. 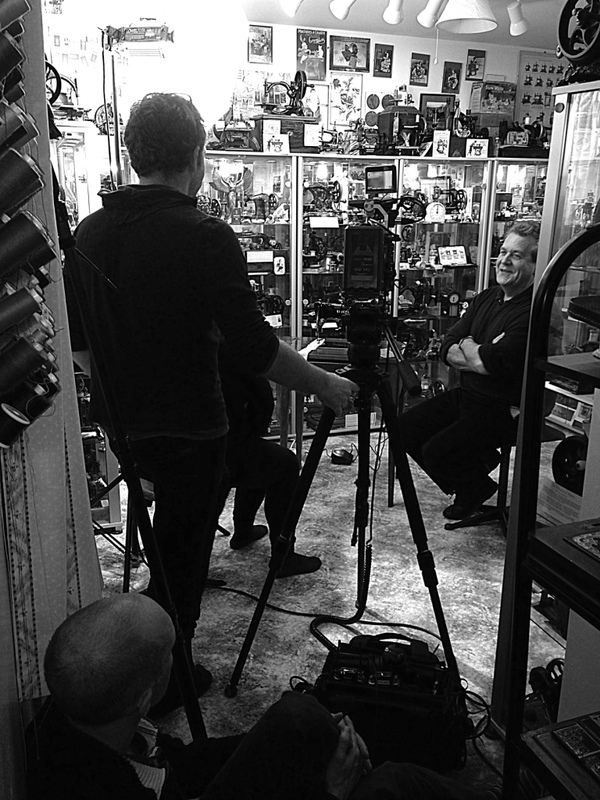 Filming of a VT clip for The Great British Sewing Bee with Alex Askaroff. Here I am demonstrating the Singer 201 that Claudia Winkleman introduced for the show. Take five. 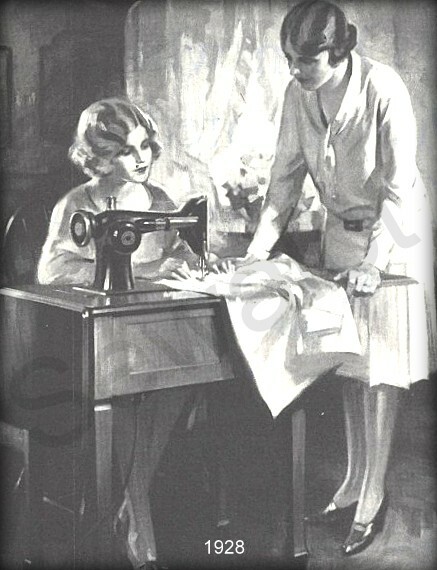 After the Great War, mass production from technologies learnt during wartime, and the supply of electricity into houses led to massive advances in sewing machine technology. The pinnacle of this technology by the 1930's can be seen in the stunning performance of Singer's latest offering, the formidable model 201, which was produced in Britain at Kilbowie, Clydebank. This British masterpiece of engineering was expensive but opened up a whole new era of opportunities amongst the working classes of Britain. The 1930's were hard, the world was suffering from a massive depression sparked by the Wall Street crash in America. The ripples were felt around the globe and millions of men found themselves out of work. This well-worn basic Singer 201 made in 1951 (Singers centenary year) had changed little since 1930. It was still cast iron and, as you can see by the open-spoke wheel, this one was originally supplied as a hand machine. In Britain unemployment and poverty manifested itself in uprisings like the Jarrow March in October of 1936. However new opportunities were also opening up. For the first time a truly professional machine was now available to the masses. 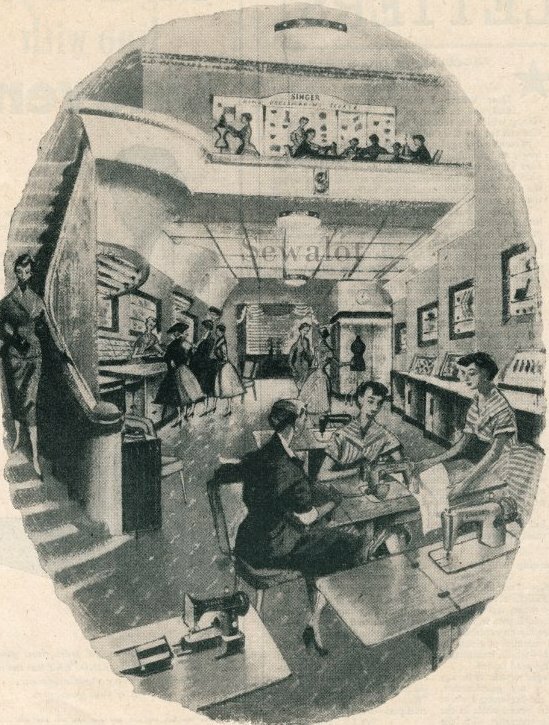 There was almost a Singer shop in every town and city in the country and in the shop windows was the new Singer model 201. Although expensive, with the help of hire purchase, first introduced on mass by Singer and his partner Edward Clark in the 1850's, women found that they could buy the Singer 201, pay for it over a period of years and earn a living from the machine at the same time. The Singer 201 was a work horse, it could be used hard and almost continuously. Whether making curtains or costumes, the woman of the household could earn a living with the machine, helping with the household bills and upkeep. For normal domestic use the Singer 201 would have been supplied as a hand machine or treadle but for the professional it could have a motor attached to it and could run at over 1,100 stitches per minute. The Singer 201 earned a reputation for reliability and stitch quality that was second to none and many households dressed their children and fed their families from money earned on this fabulous model. 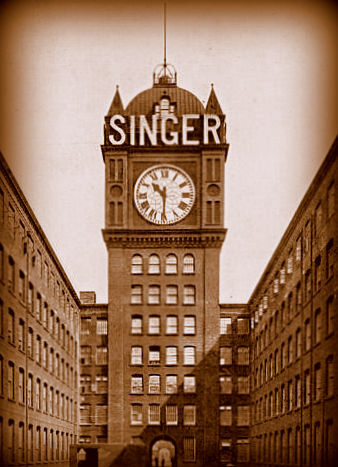 One of the greatest sewing machine factories on the planet produced many of the Singer 201 machines. 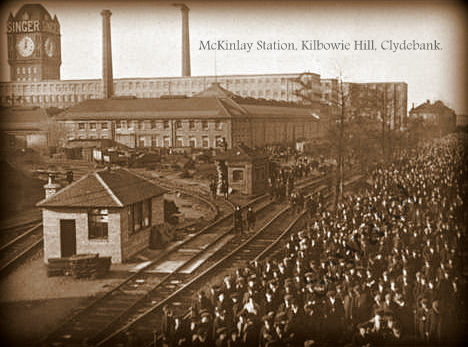 Just before the outbreak of WW1 the Kilbowie Factory employed around 14,000 workers. 1939 the Singer 201 hits the streets in big numbers. It was cast iron, heavy and superb with the added option of an electric motor for an extra £5.17s or buying it complete in its cabinet as shown here, already electrified. The modern world was here. Although the majority of houses in rural areas still did not have electricity it was sweeping through the streets, towns and cities. 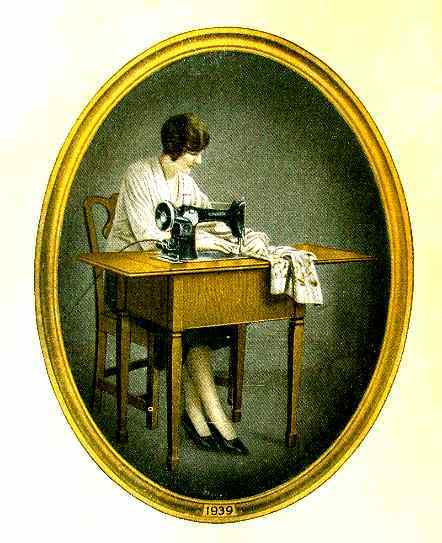 An electric machine was three times faster and you could use both hands for sewing, as shown here. The Singer model 201 first hit the streets just before the Great depression of 1929 but sales really took off for the Singer 201 just before World War II and boy what a machine it was, quite possibly the finest straight stitch domestic sewing machine in the world at the time. 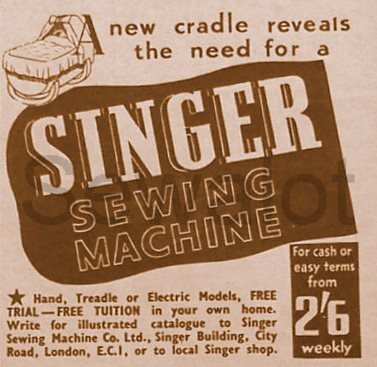 However by 1939 Singer was busy with the war effort and so all but essential sewing machines took a back burner. 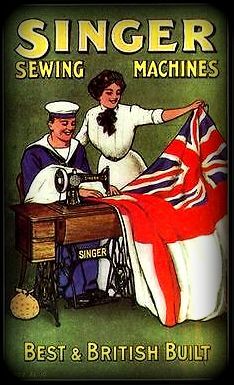 During WW2 Singers, like most manufacturing companies, helped with the war effort and turned most of their machinery over to production of items like bullets and hand grenades. Singers received their first order for 100,000 Mills No36 hand grenades in July of 1940 and marked their Mills bombs with the SMC company logo. 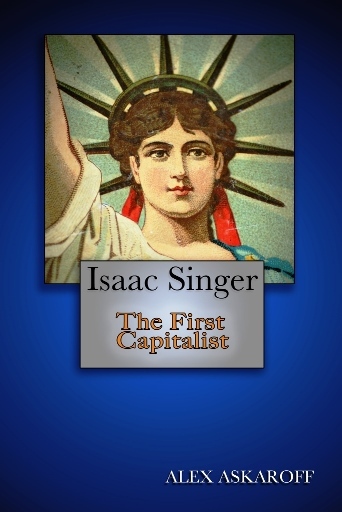 In America and Canada the Singer factories helped with automatic pistols, propellers, bomb sights, carbines, B-29 machine gun control systems and much more. Sewing machines during this period, and after the end of hostilities, became scarce and sought after, some customers waiting for over a year for their new sewing machine. 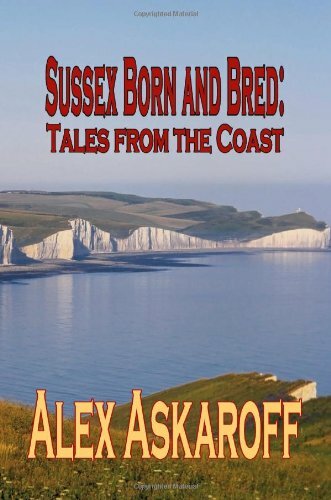 Britain, like most of war-torn Europe was trying to rebuild after the devastation of World War Two, however materials were in scarce supply and huge demand. The British Board of Trade implemented strict regulations to allow material to be used in manufacturing. Singer would have to achieve a 50% export rate to allow it to meet its material allowances. If it fell below that, steel and other materials would have been diverted to other more profitable companies. However there was one benefit. From the end of hostilities, surplus of aluminium used throughout the aircraft and other military industries was ideal for Singers, who traditionally worked in cast iron, (except for their model 221). Singers, managed to obtain large enough amounts of aluminium and the raw materials to allow the Singer 201 to be made in aluminium for the first time. The factory retooled and formed new castings and by the early 1950's they were producing the first Singer 201k sewing machines in aluminium. Legends tells that more than one Singer today may be made of recycled Spitfires. Lancasters and Hurricanes. Initially the 201 came in black, like its pre-war cast iron counterpart, but soon switched to a more modern 1950's brown. The full rotary hook and high-carbon super-hard corkscrew meshing gears, all set in a lighter alloy body, gave the machine a smoothness that other sewing machine manufacturers could only dream about. But all this came at a cost. It became Singers most expensive domestic sewing machine at the time. 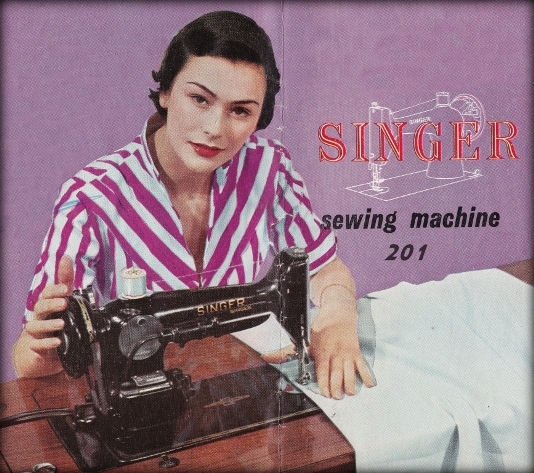 The Singer 201was bought mainly by professional machinists who would sew for a living. The Singer 201was pretty much bullet proof and could take a direct hit from a nuclear missile and still sew. Today there is still no domestic sewing machine made that will stitch better than the Singer 201sewing machine that is in good working order. When the Singer 201 first came out its basic price in a wooden box was £13.17s (the Singer 128k was £9.17s 6d, the Singer 66 £11.10s). The differences do not sound much today but they were huge back then. The price for the 201 was for their hand model but for £5.17s you could upgrade to electric. This price stayed pretty stable from the 1930's right up to the early 1940's when the same Singer 201 would cost between £13.7s and £15.8s. Add to this basic price the cabinet of your choice and motor. By the 1950's an electric Singer 201, in its basic wood case was supplied at £20.10s. Whereas pre-war you would stipulate 'electric wanted' and pay the extra, by the 1950's you would have to ask for a hand or treadle machine as the majority were now supplied as electric. Don't forget the price could almost double if you wanted one of Singer fine cabinets supplied with it. The Singer factory in Kilbowie had over 2,000 trained cabinet makers. Now there was massive inflation in the 1950's and by 1961 the Singer 201 had rocketed up to over £66. This was disastrous for Singers, when some new far eastern competitors were supplying machines at a little over a tenner. Of course there were cash discounts and other incentives and sales, there was also Singers hire purchase where the machine worked out more expensive. But you get the general idea. The Singer 201 during the war. Picture courtesy of Mrs Milligan, one of my customers. Singer's 201 was undoubtedly the pinnacle of Singer's quality machines. The 201 had arrived on the scene after nearly a century of evolution. It had the very best features of all Singer's models and a price-tag to match. The Singer 201 has gone down in history as possibly Singer's finest model. Although technology has moved on, quality has not. The Singer 201came with a few letters such as the 210k (the K that sometimes follows the number denotes that it was made in in Kilbowie, Scotland) or the Singer 201P which was assembled in Australia using parts from Kilbowie. There were also subclasses such as Singer 201k1 or 2 or 22 etc which were pretty much identical. The big change was the switch to an aluminium body for lightness. The Singer 201 sewing machines were made up until the early 1960's when they became unviable. The huge Singer clock at Kilbowie was over 80 feet round and could be seen from almost every house in the area. There was little excuse for the 14,000 workers be late when they lived next to the largest clock in Europe. The Singer 201 simply represents the very best that Singer's could make and was built to last a lifetime. Even today many professional sewers seek out this elusive model as no new machine can come close to this beauty for reliability and stitch quality. Legend has it that Rolls Royce used modified Singer 201sewing machines to sew its premium super-soft hide to panels for some of their finer car upholstery and dashboards as the Singer 201 made a small neat hole compared to the larger machines. I doubt if it is true but you can see how a machine of this quality can start rumours like this. I certainly know of a bookbinders that switched to the Singer 201 sewing machines from industrials at their factory. I used to service the machines for the bookbinders and remember clearly the rows of Singer 201's, sewing away so quietly compared to the normal factory din. 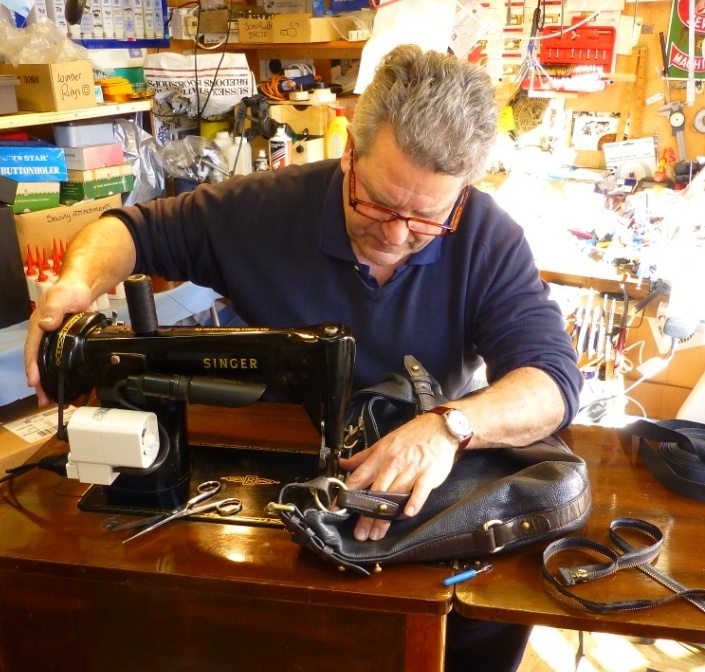 Here I am sewing a new zip into a leather handbag. The alloy 201 went through six layers of soft leather with a size 18/110 needle. It was hard work but I managed it. You could not sew anything thicker with reliable results, though there are few if any domestic machines that could handle that sort of work without damage. All the early Singers were cast iron but around the early 1950's Singer also produced an Aluminium version to reduce weight, firstly in black then later in brown. The first Singer 201 cast iron machines weighed a ton and were known in the trade as Back-Breakers! The alloy 201's were lighter and lost a bit of the ooompf (how do you spell that!) on the heavier work! The ultimate Singer showroom with the fabulous Singer 222 and the Singer 201, their two flagship machines in 1957. I remember a joke going around when I was a kid about how difficult it was to get new sewing machines in the 1950's. A woman walks into a Singer shop in post war Britain. "I would like to buy a new Singer." The Singer man just shrugs, "Wouldn't we all madam, wouldn't we all." In reality times were so hard and material so scarce that they would be put on a waiting list and be notified when one was ready. Some people would wait months for a new machine. 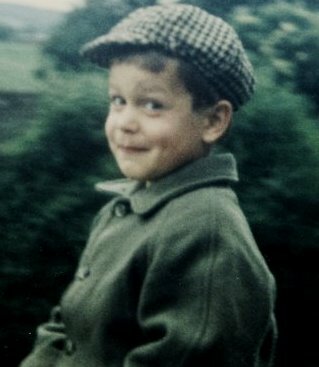 A little bit different to today eh! Singer 201k receipt 1940 when a land girl's wages were 10 shillings a week. You can see from the receipt that Mrs Jeffrey paid 13 pounds 17 shillings and tuppence for her brand new Singer 201 in 1940. Her weekly wage as a domestic at that time was just over 10 shillings. The average normal wage was a little over one pound. She had paid the equivalent of 27 weeks wages for her Singer 201K. WOW. Half a years wages for a Singer 201 sewing machine! Now in today's money what would that be? Work out what half your years wages are and you have what the Singer 201 cost in 1940. Basically they cost the same as a decent car today! Now you know why the Singer 201K machines sew better than their modern plastic counterparts. I once met a man who paid £50 for his Singer when new. He only remembered the price because he paid £500 for his house! The last Singer 201's were angular alloy and varied colours. They were still superb machines but the earlier all cast iron models handled thicker material slightly better because of the heavier flywheel/handwheel. The Singer 201 ran for nearly three decades before its production costs made it unviable and production at Kilbowie and elsewhere ceased. It was the end of an era and the end of possibly the best straight stitch Singer ever made. Sew with a Singer 201K today in good working order and you will see what I mean, puuuurfection. The Final Singer 201 was a browny-beige and by 1963 it was no more. The finest sewing machine in the world became too expensive to make. Japanese cheap imports were flooding the market and this old beauty was put to bed. By 1963 you could buy over 100 sewing machines cheaper than the 201 and the 201 only did a straight stitch! Today the Singer 201K go for silly low-prices on Ebay because no one realises how well they were made or how much they used to cost. If you enjoy your sewing and don't need all the fancy stitches grab a Singer 201K while you still can. It is a machine that will make you smile with each stitch. The Singer 201k Sewing Machine, simple perfection. In 1961 Which Magazine tested over 40 sewing machines that were on the market at the time. The tests were amazingly in-depth and, as the magazine stated, the machines were expected to take substantial work over a lifetime. You cannot imagine anyone making anything today that was built to last a lifetime! Where did it all go wrong? For example each electrical foot controller was tested over 75,000 times to review its capability. The Singer 201, won the Which Magazine overall best machine, remembering that Which was an unbiased and independent magazine never weakening to flattery. After extensive testing and abuse, including dropping the machines, the magazine stated that... The Singer 201 and Necchi Supernova cannot be seriously faulted. They were the best but also the dearest machines. The Singer 201 cost £66. 1s. 3d. (the Universal Sew Maid cost £11. 19s.). The average wage in 1961was well under £20 per week in the UK so as a minimum the 201 relates to around one months wages. That relates to the sewing machine costing over £1,000 at today's value and that is after the machine became relatively cheaper to its original 1930's price. No wonder it was such a beauty! The 201 was costing over six times the price of some of the other sewing machines! It was closely followed in price by the fabulous lightweight Singer 222k at £65. 15s. 6d. Production of the Singer 201 finished by early 1960 but there was still stock being sold at various Singer outlets as late as 1963. The Singer 201 was so expensive that some people paid over years for their machines. Not like today where some cheap machines will last you a few years before they takes up their rightful place on the rubbish mountain. Oh, and in their brief time they will stitch like only plastic can! By any standards, a well set Singer 201, is simply unbeatable for stitch quality. and many more are now available instantly on Kindle and iPad and in paperback in America and Canada. I have just read your fascinating article about singer sewing machines, especially the 201. I have one inherited from my mother who bought it in 1937 It’s in a lovely polished cabinet and was an integral part of my childhood, I used to sit beside it whilst my mother sewed all the families clothes, curtains, loose covers and anything and everything else needed. I learned to sew on it and haven’t stopped sewing since. I’m in my seventies now and live in Switzerland, I was so happy to learn about my machine, I treasure it like an old friend. I hope that my daughter will take care of it when the time comes, I will give her your article to read then maybe she will. It’s especially precious to me because my mother died in 1963, when I was only 15 and so I don’t have too many memories of her but the ones I do have are of her sewing on her machine. Another anecdote is that at one stage my father built a boat, yes , a small one but still a boat, and when it came to making the sails well, he made them on the Singer, no trouble at all! Metres and metres of thick canvas sails! As you say, these machines were work horses, built to last....but boy is it heavy!